King coil springs are manufactured to our specifications in the USA using the finest quality, high tensile, chrome silicon wire available. Our springs are specifically wound for off-road applications, not repackaged car springs. Our spring rates, wire diameters and coil lengths have been developed through extensive real world testing on all types of terrain. Our race winning designs have been put to the test in the heat of battle from Baja to Dakar. All springs have closed and ground ends to sit flat and deflect true. 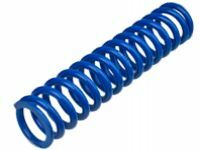 We have the largest selection of springs to match your application, over 10,000 in stock, ready to go. We sell thousands of springs a month with barely a return ever, yet we offer a lifetime warranty to the original purchaser against sagging and breakage. You will have the added peace of mind knowing you’re covered, just in case. In the rare occurrence that a spring does fail, it will be cheerfully replaced with no questions asked. Our customer support is second to none just like the quality and performance of our products. 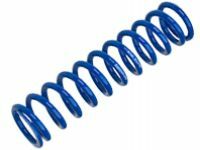 SPR375 = 3.75" internal diameter spring * fits 3.0" shock. 22 = 22 inches long. 250 = 250 lbs. spring rate. The spring rate is a number that represents the amount of force in pounds that it takes to compress the coil 1 inch. King shocks are available with many coil spring options depending on your application. 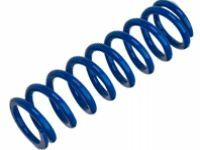 A single rate spring is a single coil on the shock. As the coil compresses the rate increases at a linear rate. If the spring rate for that coil is 300lbs per inch then compressing that coil one inch generates 300lbs., two inches generates 600lbs., 3 inches equals 900lbs. You can also have a dual rate spring which is two coils mounted to the shock. If the spring rates are equal on both coils your spring rate will be close to half that of each spring. As the coils compress equally the shock travels one inch but each coil only travels one half inch. Using our 300lb spring rate in the previous example if you have two 300lb springs and they each travel ½ inch then their combined force would be 150lbs. You also have the option of more highly sophisticated dual rate configurations that use combinations of differently rated coils and secondary travel stops to give you non-linear spring rates. They can be softer initially and then reach higher levels of firmness than a linear coil of the same length. The variations and applications involved would require too lengthy an explanation to fit on this page but rest assured our experienced sales technicians can guide you through the process of configuring your shocks to provide the ultimate in ride comfort and control regardless of your application or driving style.